Transparency International has just published its 2018 Exporting Corruption Report on the enforcement of the OECD Convention. This is the 12th edition of this report that has been published annually from 2005 to 2015. Although all countries to the OECD Convention have enacted legislation that has been considered to fulfill the requirements of the Convention (except for Peru that joined the Convention in July 2018 and Argentina and Ireland that will undergo a further review of their legislation in 2019), the level of implantation of these legislations varies widely. The purpose of the report is to highlight these different levels, based on the number of investigations, cases that have been started and cases that have been closed. Countries are classified in 4 categories : active enforcement; moderate enforcement; limited enforcement; and little or no enforcement. Seven countries are classified as active enforcers : the United States, Germany, the United Kingdom, and Switzerland that have been regularly in the active enforcement category in earlier reports, Italy and Norway, that were in that category at the beginning of the decade but were retrograded to a lower category at one point, and Israel that joined as a newcomer because it concluded its first foreign bribery case and had a significant increase in the number of opened investigations. However, from the 44 parties to the Convention, 18 countries are classified as having little or no enforcement; these countries include some major players in international trade, such as Japan, South Korea, Spain, Russia and Belgium. For the first time, three additional countries and one region that are not signatories to the OECD Convention (but States Parties to UNCAC, the United Nations Convention against Corruption), China, India, Hong Kong SAR and Singapore have been assessed because of their importance to international trade and finance. All are in the little or no enforcement category although China does have legislation on foreign bribery. 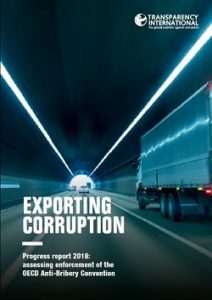 The Report stresses that over half of global exports come from countries that fail to punish foreign bribery and that this has not changed much over time. This is correct. However, it is also true that implementation by the countries in the active enforcement category has surged in the last decade and corruption now makes daily headlines. There is room for improvement but some progress has been made. Do you want to contribute to the blog? Partager la publication "TI’s Report on the enforcement of the OECD Convention is out"